When Cambridge-based filmmakers Ilisa Barbash and Lucien Castaing-Taylor lived in Colorado, they met a man making history: leading a sheep drive through the Montana mountains that would bring a century-old way of life to an end. 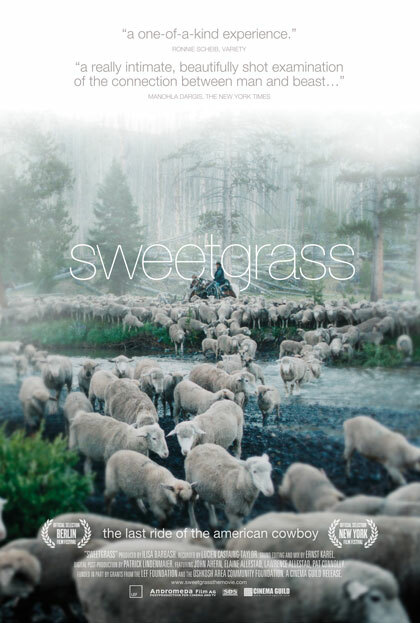 Over three grueling years of shooting, Barbash and Lucien Castaing-Taylor captured profoundly beautiful footage, and Sweetgrass is an intimate portrait of the last sheepherders of the American West. Outside of Mongolian cinema, there aren’t many films about shepherds. I have to ask: do you hear a lot of Brokeback Mountain jokes? Barbash: There haven’t been as many as I thought there’d be. One big difference with our film was that our herders were able to wrangle 3000 live sheep, but in Brokeback Mountain they had 750 live sheep which they digitally triplicated to make it look like more. Castaing-Taylor: Also, that whole thing was shot within 75 feet of a road. Our film was shot over three years of horseback riding in the mountains. At the end, viewers learn that your film depicts the last flock of sheep trailed through this particular mountain pass in Montana. What are the implications of this? Castaing-Taylor: Since the early days of the 20th century, ranchers have supplemented their operations with grazing permits. But these have become unpopular due to environmental views on the use of public lands. No new permits could be added after 1975 — some ranches were grandfathered in, but they eventually gave up because of these ideological differences. So there is no more grazing on public lands? Castaing-Taylor: There are still 23,000 public-land permits for grazing, mostly lowlands, and mainly for cattle. This is because Americans don’t eat lamb or wear wool anymore. Castaing-Taylor: People like you are rare. There are 6.25 million sheep left in the country today — which is what was in Montana 50 years ago. There was a huge surge in production after the Second World War, for wool to clothe the troops, but American demand for lamb has declined precipitously. Also, there’s a primordial-centric view of the environment that says grazing is unnatural and humanity has no right to do it. Barbash: I think the biggest reason the film gives for them not doing it anymore is that it’s just too hard. The young sheepherder’s cell-phone conversation with his mother is an incredible display of emotion, and it follows a scene where he’s screaming and cursing in frustration. It came as a shock after all the lulling, peaceful scenery. Barbash: For me, that’s a real turning point in the film — you realize this will be the last sheep drive because it can’t go on anymore. It’s also one of the few moments of intense identification viewers can have with these characters. Castaing-Taylor: After he ended the call, he turned to us and said, “I love to torment her.” Which took the edge off. There’s a lot of awareness these days about traditional food ways and small farms. So is it possible there may be a revival of interest in raising sheep in this way? Barbash: You can’t raise sheep any differently, because they’re not feedlot animals. Castaing-Taylor: These sheep are grass-fed, and eating weeds species that are becoming invasive in the West, which is wonderful. But it’s also a class issue, to be honest — sustainable agriculture is now practiced by semi-urban or ex-urban people like us. Sadly, I don’t think sheepherding will ever be part of American culture as it once was. Not if it’s only being done by a few yuppie homesteaders. So is your film an American Pastoral depicting a lost romantic past? Castaing-Taylor: The pastoral genre depicts an idyllic, bucolic Arcadia — shepherds have an innocent attachment to these innocent gamboling lambs that they will protect through thick and thin. There’s all this rhapsodic literature that recontextualizes the landscape as sublime and puts these shepherds up on a romanticized pedestal. But in our film, you actually get a sense of what it’s like to be a shepherd. It seems like such a loss to have this way of life fall by the wayside. Castaing-Taylor: Academics call this “salvage anthropology” — looking at cultures or ways of life on the verge of disappearance. Sheep were the first livestock animal domesticated by humans. Our conquest of the New World was funded by the Spanish crown, which had a monopoly on merino sheep. Capitalism began in the north of England in wool towns. The American Revolution was caused in part by tariffs on wool. Here is something on our doorstep that’s been part of human history for 10,000 years.